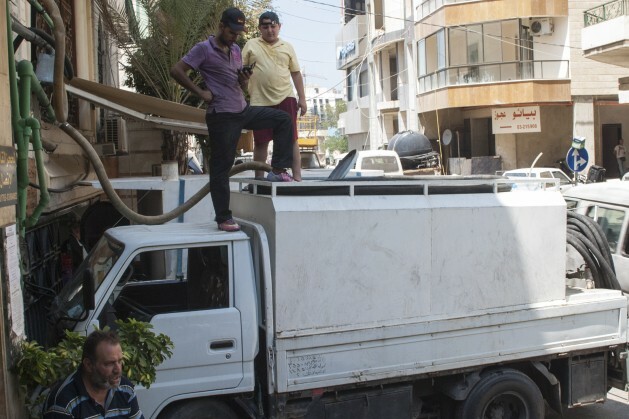 BEIRUT, Jul 28 2014 (IPS) - In front of Osman Bin Affan Mosque, in a central but narrow street of Beirut, several tank trucks are being filled with large amounts of water. The mosque has its own well, which allows it to pump water directly from the aquifers that cross the Lebanese underground. Once filled, the trucks will start going through the city to supply hundreds of homes and shops. In a normal year, the water trucks do not appear until September, but this year they have started working even before summer because of the severe drought currently affecting Lebanon. This comes on top of the increased pressure on the existing water supply due to the presence of more than one million Syrian refugees fleeing the war, exacerbating a situation which may lead to food insecurity and public health problems. Rains were scarce last winter. While the annual average in recent decades was above 800 mm, this year it was around 400 mm, making it one of the worst rainfall seasons in the last sixty years. The paradox is that Lebanon should not suffer from water scarcity. Annual precipitation is about 8,600 million cubic metres while normal water demand ranges between 1,473 and 1,530 million cubic metres per year, according to the Impact of Population Growth and Climate Change on Water Scarcity, Agricultural Output and Food Security report published in April by the Issam Fares Institute (IFI) at the American University of Beirut. However, as Nadim Farajalla, Research Director of IFI’s Climate Change and Environment in the Arab World Programme, explains, the country’s inability to store water efficiently, water pollution and its misuse both in agriculture and for domestic purposes, have put great pressure on the resource. Meanwhile, water has become an issue, with scarcity hitting particularly hard the agricultural sector, which accounts for 60 percent of the water consumed despite the sector’s limited impact on the Lebanese economy (agriculture contributed to 5.9% of the country’s gross domestic product in 2011). “Some municipalities are limiting what farmers can plant,” explains Gabriel Bayram, an agricultural advisor with KDS, a local development consultancy. Minjauw believes that there is a real danger “in terms of food insecurity because we have more people [like refugees] coming while production is diminishing.” Nevertheless, he points out that the current crisis has increased the interest of government and farmers in “increase the quantity of land using improved irrigation systems, such as the drip irrigation system, which consume much less water.” Drip irrigation saves water – and fertiliser – by allowing water to drip slowly through a network of tubes that deliver water directly to the base of the plant. FAO is also working to promote the newest technologies in agriculture within the framework of a 4-year plan to improve food security and stabilise rural livelihoods in Lebanon. Digging wells has long been the main alternative to insufficient public water supplies in Lebanon and, according to the National Water Sector Strategy, there are about 42,000 wells throughout the country, half of which are unlicensed. The drought is also exacerbating tensions between host communities and Syrian refugees. The rural municipality of Barouk, for example, whose springs and river supply water to big areas in Lebanon, today can count on only 30 percent of the usual quantity of water available. However, consumption needs have risen by around 25 percent as a result of the presence of 2,000 refugees and Barouk’s deputy mayor Dr. Marwan Mahmoud explains that this has generated complaints against newcomers. For Farajalla, part of the problem related to water is that “there is a general lack of awareness and knowledge among decision-makers” in Lebanon, and he argues that it is up to civil society to lead the process, pressuring the government for “more transparency and better governance and accountability” in water management. He claims that “the government failed with this drought by not looking at it earlier.” So far, a cabinet in continuous political crisis has promoted few and ineffective measures to alleviate the drought. One of the most recent ideas was to import water from Turkey, with prohibitive costs.